Hezbollah from Zenith to ? In an objective effort to assess the broader interests of democracy in the Middle East, perhaps the best start is to ponder the positive effects on global governance rather than an effective analysis of the bottom up evolution. Far from being rhetoric or idealistic, it is a reality to consider the democratic advancement an excellent tool for peace in the Eurasian Theater, being this in Arab Countries, in Russia, in Thailand or in China. Tactics, mechanics and achievements might differ as per each local circumstance/surrounding, yet the mainstream is that liberties coupled to peaceful rotation of power will enable a flourishing society and the empowerment of civil rights. If it is true that there is a geopolitical formula that links maneuvering drones to transparent ballots, it is also true that energy/water/food corridors and demographic aspects will play a pivotal role in setting the modern governance in the coming decades. Looking into an innovative prism of strategic concept we can easily affirm that in general all popular movements are a step forward and in particular the “Arab Spring” is a transition from a stalled and static civil society into a vibrant and dynamic interaction between many players involved in setting the interests of a collectivity. How we can intersect the interests of different collectivities and avoid clashes and conflicts, remains a hurdle, while vested interests, monetary masters of the universe, arrogant powers and revanchist souls will render very difficult the job of decision makers to converge on righteous policies. Observers are keen to consider the Egyptian, Tunisian, Yemeni , Libyan and Syrian theaters all subject to major changes that will transform the nature and essence of the state from authoritarian/despotic to relaxed and cooperative with the civil society. This will unavoidably be coupled to geopolitical deployments, where US troops presence in the AFPAk/ and Iraqi theaters will be diminished sensibly, in tandem to new deployments in Cyprus, Libya, Yemen, Syria and Lebanon. Political tools will be exploited until the objectives assigned will be reached and implemented. The final goal will be to practice an illuminated governance to tutor the interests of the global citizenry, although lobbies, associations, old states, new conglomerates and else will exert pressure to get benefits and privileges. In Syria it will be extremely difficult for the gang in power to meet the opposition demands, therefore I forecast a slow demise of the dictatorship along a period of 3 to 6 months time from today. In Lebanon, as we all know there is a new cabinet in place and it will be voted this week to have the confidence, while simultaneously the STL will do its work. Observers are concerned that an outbreak of violence might flare and a major violent strife will oppose sectarian communities. My forecast is that nothing will happen rather it is in the best interest of democracy to proceed in Lebanon with the dual game of a cabinet and an opposition, leading eventually to a peaceful rotation. Even if the diverging actual majority will generate national tickets/lists that will run the general elections of 2013, this is not a big deal. Lebanon will need to legally submit to the STL in a way or another, and all efforts of the actual government to derail it, will be voided and lost. It remains unclear how the diverging interests of the majority composing the cabinet in Lebanon will express focused governance and a successful economic policy while in contrast with the international institutions. I don’t envy a business man leading an octopus, armed with missiles willing to maintain a balance of terror with Israel and abiding by an Iranian dictate for all strategic matters of national concern. It is only a matter of time that this octopus will dissipate and part of it regains sense making. The Lebanese opposition should be very objective and express its legal standing behind the STL at all costs and by supporting the international institutions. Submitting Lebanon to justice by the international community will reveal to be for the interests of Lebanon, as this is the best alternative to war with Israel or to an internal strife. The Syrian regime stubbornness will impede any peaceful transition and in the coming weeks we will unavoidably see a Turkish major intervention setting a buffer zone and hosting the Syrian Council for Modernity. This gathering where all opposition forces will reunite under the same umbrella, multiethnic, multi confessional and plural will be the incubator for the political initiative of a new Syria. The Lebanese opposition guidance will be expressed by its adherence to the STL and staunch defense of its dynamics. Hezbollah has a choice similar to Ghaddafi and Assad, it can negotiate with the STL, include its arms in the LAF , participate in the making of a new Lebanese social pact, lead the political negotiation with Israel for the best interests of the Lebanese collectivity and finally influence the Iranian environment for a modern development within the global governance. Refusal to exert this option, will lead Hezbollah to a major confrontation with the world powers,and even if its Iranian mentor will interfere, the fate is signed and this is Hezbollah change from its zenith . As mentioned in my earlier “Orchid Diplomacy” , time is always an opportunity to evaluate and detect trends. Spinning issues were identified, some with known outcome, others with ongoing evolution. The Sudan referenda ended with great hopes for a two states entity, while Turkish general elections are still to be hold, in presence of a growing role of Istanbul, yet to become global. Egyptian desire for reforms is in process, but expectation is that a general election will be held perhaps as early as June and a constitutional amendment in the making to be implemented. If it is true that the Chinese rulers are concentrated on an easy succession to the fifth generation, in a policy concentrated on defense, energy provision & economic progress, Yuan alternated assertiveness and strong outgoing tourism, it is also true that Russian primary role beneath NATO EAST is becoming more and more pivotal, to tutor freedom inside and outside the nation and its near abroad. Comforting is the US recovery even if still to be coupled with a VAT taxation and demographic growth, together to the German and/or emerging countries active balancing dynamics, all fundamental in this current geopolitical year. It is spread knowledge that NATO will develop further and extend a bi-directional security NATO East and NATO West, as much as the G-20 or G-2 will try to exert influence and guidance in world affairs to shape events for a peaceful dynamic. While almost every analyst agrees that nurturing multiple economic hubs (US, China, India, Germany, Japan, S Korea, Vietnam, Brazil, Turkey, Indonesia, etc…) will not only lead to growth but also to a global system of control and effectiveness, the US Modern Grand Strategy is already leading the transition from mono-polar governance to a multi-hub governance. An innovative and consequential approach in foreign affairs, portended to secure the peaceful conduit for soft international relations. US Full partnership with Russia, Strategic cooperation with India, Encompassing economic concert with China and Empowerment of emerging powers, are fundamental basics for lasting world equilibrium. The latest economic data is confirming the US recovery, the German growth and that some wise adjustments are still to be put in place to keep the positive pace gathering. There is need to focus on international trade, education exchange, immigration fluxes, global security, food provisions, aid delivery, energy routes, currency fluctuations, finance regulations, reformed governance, debt reduction and collective cooperation. Above brings us inevitably to the geopolitics of the area comprised between China and Portugal considered to be the most critical for the cause of peace and humanity. Acting as ballerina the US already co-brokered a new government in Iraq, it is swiftly generating momentum for a “Jirga Governance” in the Af-Pak Theater, and pro-acting a responsible transition in the Egyptian Nile. Definitely there are still many areas of volatility and incertitude in African/ Asian poor continents, in the Middle East , the Persian/ Arab Peninsula, The Korean Theater and the South American continent, but this is where geopolitics will incisively deal progressively with events. It is remarkable the initiative for the Startup day at the White House, where interaction with a new business community, will lead to define future steps, to ease regulation, empower immigration, gradually end public waste, reduce debt, amplify employment and constantly expand exports in goods and services. Now that the Iranian attempt to become nuclear was covertly postponed, the opportunity is wide for peace talks in the Levant to advance, whenever an Israeli statesman will emerge. My conviction is that Israel is in dire need for a modern leader, pragmatic, that will lead the occupying nation from an apartheid and racist policy to an open and just policy. As mentioned in “Orchid Diplomacy”, there is still maneuver for Germany to develop a special initiative versus Iran in coordination with the US, and for France to facilitate negotiations between Israelis, the Palestinians, the Syrians and the Lebanese. Coming to the resignation of Lebanese ministers, the deposited indictment of the STL, and the nominee of a new prime minister, one needs to decide if to stay at the margin or to lower the chances for a conflagration. Being the major Syrian interest to aid and support Lebanon to tutor acceptance, tolerance and diversity by exerting democratic stability, I sense the upcoming governing formula to be 10- 10-10. However before this can be applied it is needed that some parliamentarians including the nominated PM and the PSP, declare to be under the umbrella of the president of the republic, to safeguard somehow the cheated and displeased citizenry. Only then can a cabinet be formed, without altering the strategic equilibrium and by setting the premises for a peaceful transition for reforms. The French and German initiatives in tandem with US benediction will have a beneficial effect on peace in the ME, and the future of the relations with Iran. These will obviously create an environment for transition, justice, stability and reforms in Lebanon. Although my convincement is that Lebanon needs an internal “ Commission for prosperity and truth “ that will look into the crucial topics, follow up on the STL and define harmony to establish good governance, the requirement is for the different communities to meet and agree on the interests of the Lebanese collectivity. 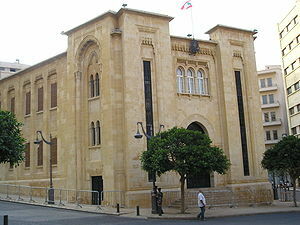 Lebanon’s future is to become a specialized pole for conventions and a net energy exporter. Lack of implementation of the above vision will maintain in place two red lines, the security of the state of Israel and the sovereignty and freedom of the Lebanese state. 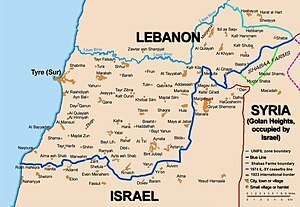 Any one sided government in Lebanon will trigger a “Casus Belli” as it will alter the strategic equilibrium, and this means a major military invasion that will be expanding and multi-theater, overwhelming, disproportionate, decisive, aggressive, fast, very powerful, incisive, unrelenting and irreversible. From here Hezbullah, Syria and Iran are put on notice. The major threat is the vengeance desire and the arrivism and filibuster spirit hidden in the political acts of Hezbullah, and this must be contained for the best interest of Lebanon and the area. Power and influence should walk hand in hand with winning arguments not with plagiarism. Palmyra and Akkar can become territories for alternative energy to provide wind electricity and water to an ever increasing population and consumer spending, only if the words of the Syrian ruler will be followed by deeds, and the US ambassador to Damascus should make every effort to make this clear. May Assad listen to avoid a cataclysm. Dear Reader, Peace will prevail as it will be defended by a formidable armada and by an extraordinary display of power, diplomacy and intelligence. Sage activists will impede war and will navigate between conflicting areas focusing on converging interests. The French/ German entente will increase the role of the Euro 1 to evolve into a Euro 2, and even if many critics do not see a political union in Europe, this model can be enlarged to include many Mediterranean and Asian nations. I imagine an “Orbi” parliament in Beirut where representatives of the variety of nations will gather steam and talk about life. The reform of the UN can be activated by a De Facto world Parliament.